proving that being “the right stuff” in space doesn’t mean you’re not a spineless stuff on the ground, is it any wonder that the Columbus Day in the United States is becoming more and more controversial? Columbus, after all, was a Catholic imperialist; he might have reached the wrong continent on his way to find a direct (i.e. not Muslim-blocked) route to China, but his “discovery” of the West Indies has led to the virtual disappearance of the native inhabitants of the Americas, following the destruction of their traditional way of life and their cultures and polities. 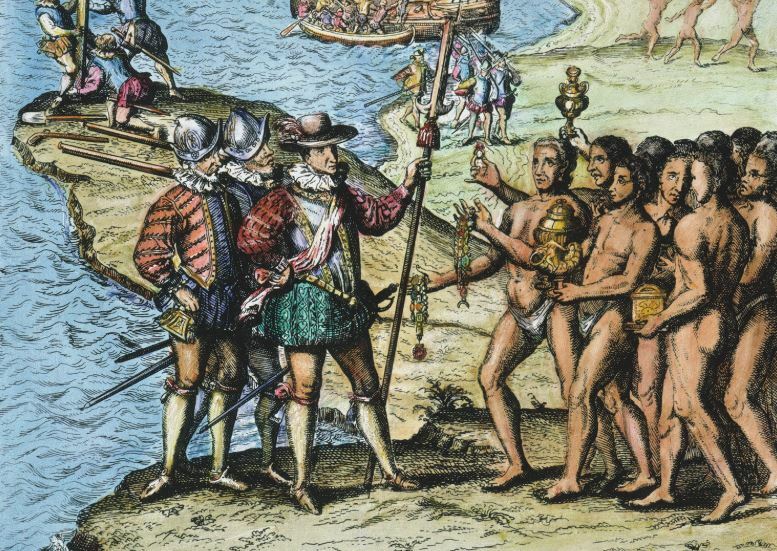 As a Pole, I’m kind of glad that we didn’t discover anyone (even though there are some crazy theories that Columbus was actually the son of a Polish king and that John Scolvus, another explorer credited with first reaching North America, was Polish too) as this seems to nowadays be the source of endless guilt. Instead, Poland itself has been extensively colonised by Germans and Russians, though at least no one is claiming to have first discovered Poland. As an Australian, I can relate to the Columbus Day controversy, since our very own Australia Day invokes endless and frustrating debates about celebrating white invasion, colonialism and black genocide or at least dispossession. The difference is that Australia does not have any other national holiday – it’s Australia Day (commemorating the landing of the First Fleet in 1788) or bust. The United States, on the other hand, has the Fourth of July, celebrating its independence and nationhood, which to me is what matters more than being “discovered”. From that point of view, the Columbus Day has always struck me as somewhat superfluous. Sure, Columbus did reach the Americas and therefore set in motion the modern history of the two continents, but he actually landed somewhere in the Bahamas and never got anywhere near the territory of the United States. Considering the Anglo-Saxon heritage of the USA, it would make more sense to celebrate John Cabot, who though another Italian, had sailed across the Atlantic under the commission of Henry VII and was the first European we know by name to have reached the coast of North America at Newfoundland – not counting Leif Erikson the Viking, of course, who got there five centuries prior, and whose proud statue now stands outside the Reykjavik cathedral in Iceland. The problem with the Northmen was that while they most definitely reached the modern day Canadian maritimes and the New England, their settlement was short-lived and inconsequential. What Columbus has wrought wasn’t – in time leading to the English colonisation of North America, and another national holiday, the Thanksgiving. I get how the Columbus Day is painful to the descendants of the Americans of 1491. They have been the history’s losers. Without wanting to downplay the violence of the European colonists, whether the Spanish or the English, the overwhelming majority of the First Nations succumbed not to the sword but to the Eurasian pathogens to which they had no immunity. Their extinctions would have occurred even if the European explorers were angels on a mission to teach the West Indians to read the poetry of Dante in the original Italian. It’s a tragedy, not a crime, the same way that the Black Death that reduced the European population by between a third and a half in the 14th century was not an Asian atrocity but simply cruel life and a consequence of humans not being sedentary creatures. Atrocities there still were aplenty, from Hispaniola to the Wounded Knee, but I’m not sure whether the talk of an indigenous holocaust is necessary the most accurate and helpful description of what has occurred in the Western Hemisphere post-1492. The problem of the Americas is the problem of the entire human history writ large. From the time immemorial, groups of people have always conquered and subjugated or exterminated other groups of people, whether in pursuit of land and livelihood or riches, fame and ideas, religious or secular. Those more technologically advanced or at least better organised and more aggressive have always strived to expand their reach and influence. This has happened in all parts of the world and to all races and all cultures. In the Americas, the Aztecs, the Incas and the Iroquois were only the most recent of successful imperialists and empire builders. The fault of the Europeans was that they were the most effective imperialists in history, in large part due to their technological edge. To apologise for that today makes as much sense as to express regret that Rome had vanquished Carthage or that the Mongols had once ruled China. In any number of alternative ways the world history might have unfolded, the Americans could have been colonised instead by the Chinese, the Muslims or the Africans – or, indeed, the Americans might have colonised Europe or Africa. What’s almost completely impossible is each land mass in the world staying forever in splendid isolation, leaving it to its own people to keep conquering each other. Where do we go from here? I don’t know. History is history and nothing will change it. The present is both the beneficiary and the victim of the past. It has always struck me that endless debates about the rights and the wrongs of history – in particular judging history by the standards and the mores of today – is a pretty barren exercise. If we do genuinely care about the fate of the conquered we should work to ensure that their descendants fully share in our life today. To don sackcloth and sprinkle ashes on our head while bewailing events a few hundred years ago is not going to increase the average life expectancy of Native Americans any more than abolishing Australia Day will cause the fall in the rate of child sexual abuse in remote Aboriginal communities. Feel guilty about Columbus or the First Fleet? Channel your energies into something practical and constructive, not the theatre of the symbolic – and pointless.